Defined as the presence of lymphoid follicles in the thymus regardless of the gland size. In fact, the gland is of normal size in most cases. Thymic follicular hyperplasia is present in about two-thirds of patients with myasthenia gravis. This thymectomy specimen is from a 45 y/o female who presented with long-standing history of muscular weakness and was eventually diagnosed with myasthenia gravis. 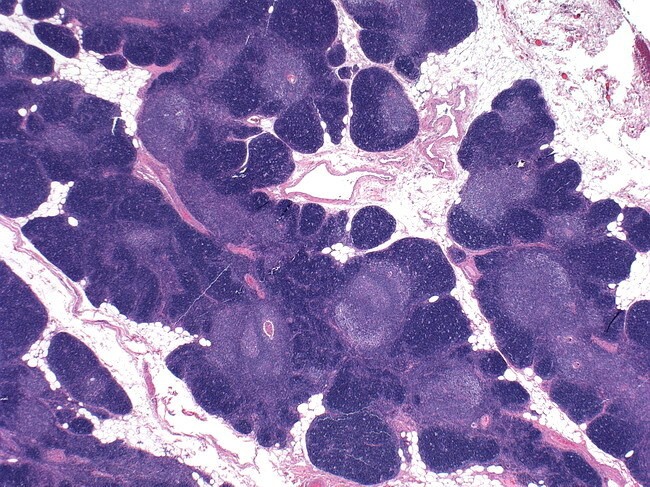 Note the scattered lymphoid follicles.